I have commented a couple of times on Jordan Loveridge, the best recruit in Utah, and how Weber State was in his final four. Loveridge announced today that he would play for the University of Utah, and it sounds like the fact that they are in the Pac-12 was a huge factor in his decision. 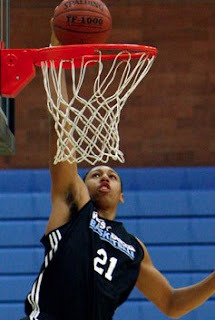 Jordan Loveridge, the 6-foot-7 forward who shot up national rating charts after a dazzling showing in the Adidas Super 64 last month in Las Vegas, will join the Utes in 2012 after playing his senior year at West Jordan High School. "I have a great relationship with every single coach," Loveridge said. "I just want to be a part of the rebuilding we’re going to get the program back to where it was and we’re going to do it in the Pac-12 one of the biggest conferences." Loveridge put Arizona in his final four, even though they had not made an offer. If he is looking for exposure, Utah might be the best play to go, as they are in a power conference and so he has a better chance of being seen on national TV. Also, Utah is very down right now, so he could have a chance to play relatively early in his career. However, he certainly would have had a better chance of being in the NCAA Tournament if he had gone to Weber State. The Wildcats have been contenders for the Big Sky title almost every season under Randy Rahe, and that doesn't seem likely to change anytime soon. Loveridge is the type of player that would have been a star in the Big Sky. But alas, it was not meant to be. New coach Larry Krystowiak recruited Loveridge hard, and in the end, it was enough. It will be interesting to see how early he is able to get on the court. He has been rising up boards quick, so this commitment could look even better for the Utes a year from now.